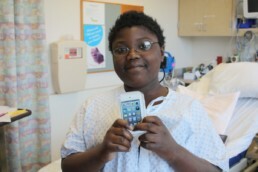 Zyreal, who received an iPod touch from a generous CRBS blood donor, receives regular red blood cell transfusions to treat sickle cell anemia. Zyreal is a wonderful performer and CRBS nursing staff love to hear him sing. Red blood cells are the most common type of blood cell and carry oxygen from the lungs to all body tissues. Red Blood Cell transfusions are routinely used for surgical and trauma patients. Other patients who benefit from red blood cell transfusion include those with anemia due to kidney failure or bleeding, and those with blood disorders such as Sickle Cell Disease. For a whole blood transfusion, the blood donation is kept intact and not separated into components. Whole blood transfusions are primarily used for infants and during surgical procedures. Plasma is the liquid portion of the blood in which the red cells, white cells, and plasma are suspended. It consists mostly of water containing dissolved salts and proteins. Plasma transfusion is used to control bleeding during surgeries and trauma, and to treat patients with clotting disorders and major burns. Platelets are tiny cell fragments circulating in the blood. Platelets gather at a bleeding site and clump together to form a plug that seals the blood vessel. They also release substances that promote further clotting. Platelets are often transfused to patients with bleeding disorders, and to those undergoing cancer treatments and organ transplants. Cryoprecipitate is a frozen blood product prepared from plasma. It is rich in clotting factors and commonly used to treat trauma victims and patients with bleeding disorders. CRBS collects specialized blood products for use in research and patient care, such as autologous white blood cell products for manufacture (insert link to Dendreon? http://www.dendreon.com/). CRBS partners with MultiCare Health System to provide whole blood and platelets for pediatric heart surgeries though our Baby Blood Program. Special products are also collected for ECMO life support and LVAD placement surgeries. Over 170 such surgeries and procedures are conducted annually at MultiCare. Someone needs blood every three seconds in the United States. The only way to get the blood needed is from a volunteer blood donor. Here are some stories about how blood donors save lives. In September 2014, Serina Clark became severely ill at work and was taken to Tacoma General Hospital. She was admitted to the hospital with a rare and life-threatening blood disorder called “Thrombotic Thrombocytopenia Purpura” (TTP). She was in the hospital for 5 weeks and underwent a series of Therapeutic Plasma Exchanges conducted by CRBS nurses while hospitalized. Serina is a true testament as to how blood donors truly do save lives. In this video, Serina and Jeannie Nielsen share her journey back to health. In May 2012, shortly before graduating from Cascade Christian High School, Sarah was in a near-fatal car accident. This is the story of how blood donors saved her life. Bob, an active member of the Pierce County community, began to experience chest pains at work on Sept. 15, 2011. He quickly found himself at St. Clare Hospital receiving treatment for a ruptured aorta. While his family prayed and waited, Bob underwent hours of surgery. During two surgeries that lasted more than 21 hours, Bob received 42 units of blood. This is the story of how blood donors saved his life. After five years of marriage, Laura and Pat Jenkins were expecting their first child. While giving birth to their daughter, Dawn, Laura required 10 units of O-Negative blood. With the blood supplied by CRBS and the expertise of the staff at St. Joseph Hospital, Laura survived. Pat, Laura and Dawn currently live in Puyallup. She and her family are extremely grateful to their community for helping save her life. See her story here. Mary Young, a busy wife, mother and grandmother, went to the doctor in 2005 for a routine exam. She was not expecting that exam to turn into a diagnosis of multiple myeloma, cancer of the plasma cells. As part of her treatment, Cascade Regional Blood Center collected, processed and stored her healthy peripheral blood stem cells for transfusion. Mary received a stem cell transplant to infuse healthy cells into the body with the goal of those cells overtaking and replacing the damaged cells, along with blood transfusions as part of her treatment. This is her story. Blake Rogers was born at St. Francis Hospital on September 29, 2009 with transposition of the great arteries. At four days old, he underwent open-heart surgery at MultiCare Mary Bridge Children’s Hospital & Health Center, and received units of baby blood that CRBS collected especially for him from special baby blood donors. Here is his story.